Are you ready to go on the EdgeWalk at the CN Tower? Tickets go on sale this week to those members of the public who want to take a few death-defying steps on the outside of the tower, 116 storeys and nearly 1,200 feet up. It’s the newest attraction to the city and one that’s already creating buzz around the world. The hope is EdgeWalk will join Toronto’s other great attractions and characteristics to keep visitors coming in record numbers. In 2010, the city attracted 10 million overnight visitors who brought in $4.5 billion in revenue. 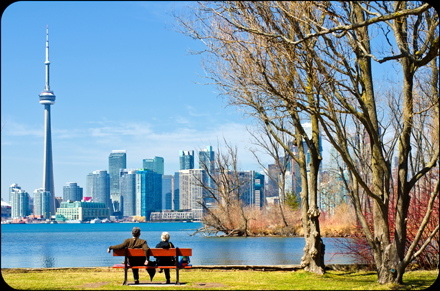 As Toronto’s tourism industry boldly proclaimed its intentions of “Reaching Higher” on Tuesday it also soberly acknowledged the strong headwinds it faces in maintaining the tremendous momentum it has established in the past few years. The emphasis for this year will be to get more people into Toronto over the holidays, Tourism Toronto pointed out. “Our hotel occupancy rate in December drops to 49 per cent,” Whitaker said as he underscored an area that needs improvement. Perhaps most interestingly, though, is Tourism Toronto’s alliance with their counterparts across the province. With the success that Toronto has had in attracting visitors — it moved up to No. 6 in the U.S. and Canada in hotel occupancy rates in 2010 — the rest of Ontario is hoping to learn from its expertise and with its focus on the international market the agency is happy to spread its knowledge. Niagara, other markets in the GTA, Stratford and Prince Edward County are obvious areas that visitors would be happy to explore, and so would the Muskokas, the Bruce Trail, Algonquin Park and Georgian Bay. We’ve got a great city (TTC aside) and a terrific province, so good for the tourism biz for bringing the world here and good for you for impressing people so much they want to return.